Based in Mitta Mitta, the northeast Victorian town of only 200 people, the brewery and hop garden was founded by Tim Cabelka and Alec Pennington, together with their partners Jen Cabelka and Chris Rowe. Cabelka, a former brewer at Red Hill Brewery, made the journey with his family from Mornington Peninsula to construct the brewery and hop garden on Pennington’s farm. “The hop field was the first thing we laid down back in 2012. Currently we have been using only hops grown from this field in our beers,” Cabelka told Brews News. The brewery grows three different hop varieties on a quarter acre plot: Mt Hood, Saaz and Super Alpha. “Thursday last week saw the brewery become a hive of activity as folk from near and far came to help us for our first hop harvesting day of the year,” Mitta Mitta reported on its Facebook page on February 7. “We knocked the Super Alpha hops over in record time and were kicking back sampling the beer by lunchtime. “The harvest yielded 10kgs of hops which we dry, vacuum pack and freeze until it’s needed for brewing. 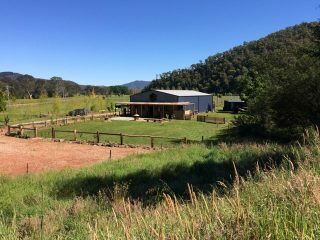 Mitta Mitta used crowdfunding to raise the remaining funds needed to complete its brewpub and was overwhelmed by the support of the community, according to Cabelka. “We reached our target within five days, and exceeded it by 150 percent,” he said. Cabelka built Mitta Mitta’s 200-litre brew kit himself. In production since late last year have been a pale lager, a mid-strength amber dubbed MiddaBitta and a dark ale called Black Velvet Revolution. The shed turned pub is due to open in the coming months. It was constructed from locally sourced and recycled materials, with Pennington’s cooking background driving the food offer. For now Mitta Mitta Brewing’s beers can be found at Mitta Pub, Dartmouth Pub and in bottles at Mitta IGA.